What Are Superfoods And Should You Eat Them? Super. Superheroes. Superfoods. Supercalifragilisticexpialidocious. So are superfoods really supercalifragilisticexpialidocious? Is all the talk about superfoods just non-sense or truly fantastic? If a food is powerful enough to help you lower your risk of cancer, heart disease, diabetes and for an added bonus, puts you in a better mood then it is truly fantastic. Food as medicine and you are what you eat do have more than a kernel of truth. Increasing your energy in part by stabilizing blood sugar and helping your muscles function better. Wild Salmon - This is another rich source of protein, vitamin D, selenium, B vitamins and the anti-inflammatory Omega-3s as well as Carnitine. The best salmon to buy? Wild caught, Alaskan salmon, which ranks low in contaminants and high in nutrients and you need just two servings of Omega-3 rich foods. Walnuts or Almonds - Just a small handful a day will deliver a healthy dose of omega-3s, alpha-linolenic acid, copper, manganese and the form of vitamin E which helps protect your heart and brain. Walnuts on your plate a few times per week may also protect your brain and help slow the onset of neuro-degenerative diseases. Blueberries – Blueberries contain disease-fighting phytochemicals, flavinoids and soluble fiber. They have the potential to help reduce the risk of serious diseases like heart disease and help lower blood pressure in postmenopausal women. Virtually all fruits and vegetables have powerful health effects and in general should constitute half of your plate. Beans, Peas, Lentils – These help raise levels of the hormone leptin which curbs appetite. They also deliver a powerful combination of B vitamins, calcium, potassium and folate. All of this will help maintain healthy brain, cell and skin function and even helps to reduce blood pressure and stroke risk. Avocado - This Superfood contains healthy fats and nutrients like oleic acid, lutein, folate, vitamin E, monounsaturated fats and glutathione which help protect your body from heart disease, cancer, degenerative eye and brain diseases. Cruciferous vegetables – These are vegetables like broccoli, cauliflower, cabbage and brussel sprouts. They have the ability to inhibit the growth of some types of cancer cells and even stop others by reducing the production of free radicals. These power packed veggies reduce risk for cancer by increasing glucosinolate. Green leafy veggies - Spinach, Kale and Swiss Chard deliver more nutrients with very little calories and filled with fiber, vitamins-A, C, K, minerals like potassium, magnesium and calcium, as well as phytochemicals. These foods help you reduce your risk for heart disease and cancer. Quinoa - Is a perfectly complete vegetarian protein high in fiber and rich in Betaine, which is TMG (trimethylglycine) - an energy booster. Oats - A great source of fiber and helps lower cholesterol. Soy - A complete protein that lowers cholesterol and in some women may help blunt hot flashes. Tea - Green, black, white, herbal, and roobios teas are rich, flavorful and calorie free and most adults can enjoy in moderation and reap some health benefits. Chocolate - A rich, powerful, delicious treat that actually does a body good. It can elevate mood (hence many women with PMS crave chocolate that time of the month). Chocolate can improve blood flow and even lower blood pressure and it's full of antioxidants, which can help prevent cell damage, degenerative diseases and even cancer. Only a small amount is needed and dark chocolate is best. So for breakfast try some Greek yogurt with blueberries and chia seeds. For lunch, try a sliced avocado with spinach on your turkey whole grain sandwich and a side of quinoa kale cranberry salad. And perhaps for dinner, wild salmon, Brussel sprouts, beets, lentil soup and a chocolate walnut brownie. While you won't morph into a superhero with superpowers, you just might feel like one! Holly L. Thacker, MD, FACP is nationally known for her leadership in women’s health. 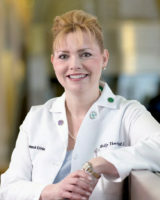 She is the founder of the Cleveland Clinic Women’s Health Fellowship and is currently the Professor and Director of the Center for Specialized Women’s Health at Cleveland Clinic and Lerner College of Medicine at Case Western Reserve University. Her special interests are menopause and related medical problems including osteoporosis, hormone therapy, breast cancer risk assessment, menstrual disorders, female sexual dysfunction and interdisciplinary women’s health. Dr. Thacker is the Executive Director of Speaking of Women’s Health and the author of The Cleveland Clinic Guide to Menopause. Lose Weight and Become Less "Sweet” by Improving How Your Body Responds to Insulin! Olive Oil, The Old And New Elixir Of Life! Herbs and Spices are the Spice of Life!